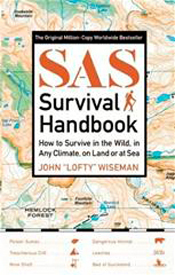 Survival experts regard the SAS Survival Handbook as one of the best books ever written on the subject. The SAS, or Special Air Service, a part of the Special Forces unit of the British military, along with the US Navy Seals are the first modern military organizations with specialized units. John "Lofty" Wiseman was in the SAS for 26 years. He wrote the book in 1986, one year after he left the SAS. It is based on years of experience of surviving many different scenarios. Wiseman teaches, from first-hand experiences, methods that work. The underlying message of the book is that you can survive almost any situation if you are prepared ahead of time. "Master your environment" is a theme repeated not only in the SAS Survival Handbook, but also in every other survival book ever written. Your degree of awareness will either keep you alive or put you in harm's way. This book is divided into 23 chapters and 9 appendices on 575-plus pages about surviving any environment on earth, including in the sea. After reading this book you will be able to identify poisonous plants and animals, perform most first aid procedures, use Morse code and other signaling techniques, as well as many other life-saving measures. In order to survive any situation you have to plan and make an educated guess about the kinds of emergencies you will face. Whether you are in a city, the suburbs or the wilderness, each location has a unique emergency you might encounter. Analyze any potential threats unique to your area and devise different solutions based on the resources available to you. An emergency can force you to evacuate your home base, and the SAS Survival Handbook has one chapter dedicated to essential items to put into a survival kit. The actions you take will be based on your plans, and your survival will depend on how you deal with many psychological factors. The way you react to the stress in these conditions will determine your long-term chances of survival. Even though a chapter is dedicated to this subject, you should reinforce what you learn in this book by taking courses on stress coping mechanisms. The SAS Survival Handbook includes a section on basic survival medicine, which covers life-saving steps for medical emergencies and the requirements for maintaining your health. You will learn to take care of bone and joint injury, clean and take care of wounds and perform basic first aid procedures. If you are in the wilderness, the section on plant identification and herbal remedies will help guide you to identify plants you can use to eat, heal yourself or avoid because they are poisonous. The author uses color pictures to identify the plants and poisonous insects, spiders, lizards and other animals you must avoid. If you do not have the right type of shelter for your environment, your chances of long-term survival are drastically reduced. If you have to make your own shelter, the SAS Survival Handbook can guide you on how to build the best shelter with the resources you have around you. You will learn how to choose a location and build a type of shelter suited for the location. You will not survive for long if you do not have enough food and water or learn ways of replenishing your supply. If you are in the wild and you run out of water purification tablets and filtering devices, you have to use the resources around you. This handbook will guide you, step by step, in how to find water and the best way to store and use the water. The SAS Survival Handbook teaches food procurement and how to use plants and animals, including fish, as a food source. Instructions on how to build snares, traps, killing and fishing devices are explained in full detail, as well as cooking and storing fish and game. The art of fire craft is a skill you must master because it is a very useful tool. The section starts with basic fire principles all the way to lighting a fire. A Post Apocalyptic World (PAW) might sound unrealistic, but it is possible, and a nuclear device is not necessary to create the scenario. In the novel One Second After, Electromagnetic Pulse attack, or EMP, is responsible for a complete blackout eliminating modern utilities and supply. In the real world, a large solar flare can create the same EMP effect and create blackouts. If the solar flare is strong enough and covers a large geographical area, it can have the same effect as in the novel. Instructions in the SAS Survival Handbook teach you how to survive even this disaster.